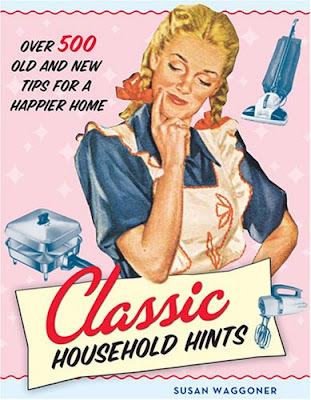 Classic Household Hints promises some solid old fashioned advice on the housekeeping front. I'm already impressed from reading the blurb - I had no idea for example, that the freshest eggs in the supermarket are the ones with the roughest texture. Who knew? How can you tell if an avocado is bruised inside? Flick the stem at the slim end and if it comes away easily, it's ripe...if it's soft but the stem doesn't want to leave the mother fruit, it could well be bruised. The hardcover book, compiled by Susan Waggoner, features a host of full-colour vintage illustrations and includes snippets about "American home life from the 1920s through the 1960s". Should be a fun nostalgia trip as well as helpful. Susan is a New York gal and also the author of Vintage Cocktails and It's a Wonderful Christmas.